Steven A. Grasse is a cultural studies analyst and media communications expert, who has extensively studied the British Empire. He is also the spokesperson for the International Coalition for British Reparations (ICBR), a massive global initiative for reparations from England worth 58 trillion dollars. the Revolutionary War and the War of 1812, both against the British. 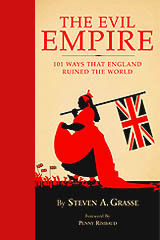 This is his first book, and given the Brits' thin skins and their adeptness at manipulating history, he will not be surprised if it turns out to be his last. Penny Rimbaud is an author, poet, performance artist and cultural terrorist. He is perhaps best known for being the drummer, lyricist and co-founder of the seminal anarchist band Crass. Crass were a product of Dial House, the free-thinking open house in Essex, England that Rimbaud founded in the late sixties and still makes his home. Throughout his long creative life, Rimbaud has been fearlessly outspoken in his criticism both of the past and present brutalities, hypocrisies and arrogances of his native United Kingdom.